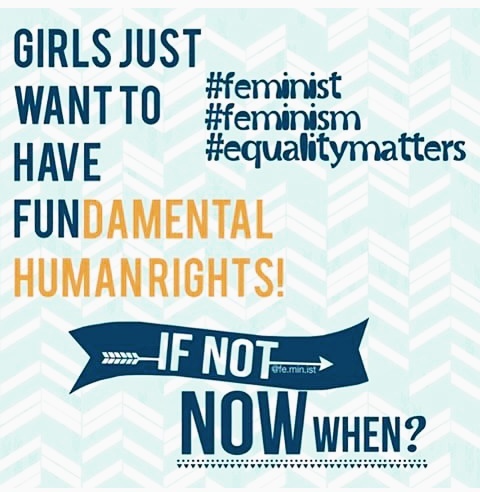 Why You Don’t Need Feminism – That Girl Dorian. “A woman who seeks to be equal to a man has no ambition”. The person who said that was terribly shortsighted. You don’t need feminism. You know who does? long torturous years of violent sexual/physical abuse. *The girl-child who is used as a currency for marriage, who becomes a baby making machine even before her organs are fully developed. *The women whose dreams,aims,goals and aspirations die right before their almost-always tear-filled eyes even before they can learn to spell their names correctly. *The girl-child who is shot in the head or splashed with acid because she dares to desire education. *The girl-child who is brought up with the “you’re a girl, therefore you’re useless” ideology. The one who has zero level of self esteem. The one who has been taught to believe that she is of no use to society and must always be relegated to the background. *The women whose ability to dream of a bright glowing future has been eliminated by their society. The ones whose inner fire has been put out because they are constantly reminded that being a female is the worst thing that can ever happen to them. *The girl-child who is made to believe that marrying a man and answering his name is the only thing that makes her complete. The woman who is constantly told that the kitchen is the only place where she can be relevant. These people are in great need of feminism, not you. Previous Book Review: The Lightning Thief by Rick Riordan. Next To The One That Never Knew. Both men and women are equal to every task here on earth,be it social,academic,politics or in a Home we all have our parts to play. And our parts are not the same,women were born to support while men were born to control that’s my believe and I think instead of women to think about controlling and doing the men’s job they should rather focus on support. Just imagine having a wife who is running for presidency in Nigeria and you’re a Husband working in some insurance company,the first question that runs through the man’s mind is the issue of support,will she remain the same woman I know before I married her?. The man naturally has it in mind that he is joined to the woman and he’s committed to his responsibilities in the relationship (not all men though) but will fear the woman shifting her focus from her part in the relationship to taking up another responsibility that she has just found for herself… I wanna guess we all have that fear sometimes in that situation so I think it’s all resting on the same shoulders. What’s most important is that we are both committed to building a strong relationship and laying the right foundation for our children rather than focusing on some new career,ambition or whatever that we have found for ourselves… If you have a good car and you know how to drive,you will get to where you’re going quickly. Great post! Growing up in a 3rd world country, you don’t have a lot of choices. But I’m so glad it’s changing, at least in my country. The problem with most people who advocate feminism, especially in first world countries, is that they try to use feminism as an excuse to get more privilege. Instead of helping other girls who get constantly abused, they use feminism to empower themselves when they already have satisfactory lives. I know it doesn’t apply to everyone who lobby feminism. But most people use feminism as a political agenda to get into power. Power can be use to do good, but it can also go the other way. Influence can be a good thing, or a bad thing. It’s the same with feminism. When we only think of ourselves, instead of those girls who have gone through difficult situations, then what really is the purpose of feminism – of equality? Your comment is awesome! I’m happy someone shares this idea. Thank you!